Sol 2250-51, December 3, 2018, update by MSL scientist Suzanne Schwenzer: On sol 2250 Curiosity finishes the observations on and around the Highfield drill hole and drives on to an area where red Jura is exposed. The dataset Curiosity collected at the Highfield location is very informative already before tosol’s activities. It includes observations that especially benefit from the longer stay, such as the change detection imaging experiments. 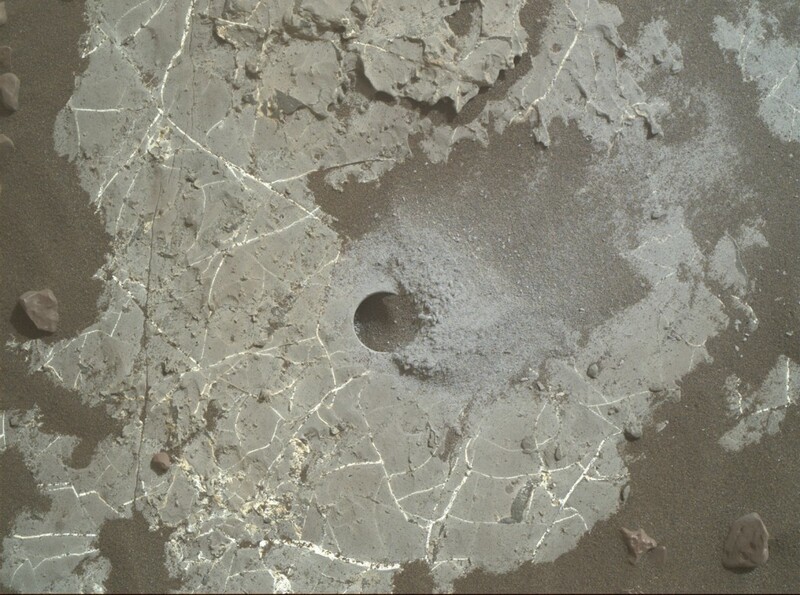 In one of the images, the sand movements became very apparent by the drill hole already starting to fill in – not a planned change detection, but an interesting one nonetheless. It is just a few sols since we drilled, yet sand has drifted in and parts of the drill fines have blown away. We were once more reminded, just how active Mars is! This entry was posted in Reports and tagged Aeolis Mons, Curiosity, Gale Crater, Highfield, Jura, Lothian, Mars Science Laboratory, Mount Sharp, MSL, Murray Formation, NASA, Niddrie, Vera Rubin Ridge. Bookmark the permalink.